Kuwait, December 04, 2018: The year, the months, and the days are moving fast, and here comes the cheerful festive season again. And Symphony Style Kuwait, A Radisson Collection Hotel, has you covered this festive season with the elegant decorations that is spread all over the hotel. The key to an unforgettable festive season is not just the cheerful atmosphere, but sprinkle it with lots of laughs, joyful moments, and a little bit of magic. Symphony Style Kuwait, is marked with a special tree lighting and carol singing evening on the 1st of December 2018. 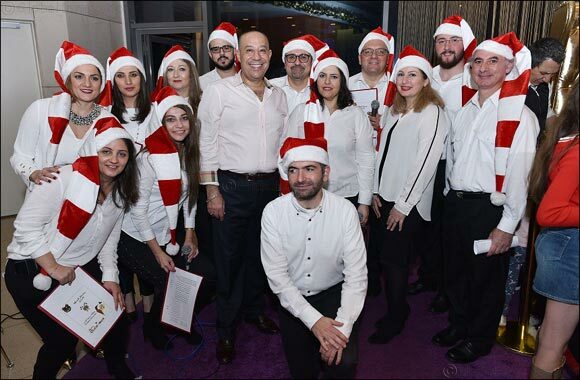 The hotel assembled a choir to sing traditional festive songs and carols during the festive gathering with members of the in-house team joining in with guests round the large, stunningly decorated golden trees in the hotel’s lobby area. The festive cheer was raised a few more decibels when the lights were officially switched on during an engaging ceremony. The Food & Drinks team meanwhile is ensuring all festive tastes are catered for this season by offering an extensive Festive Goodies menu and gourmet treats. The menu includes specially prepared made-to-order roast turkeys with all the trimmings in addition to a range of sweet treats, some specialty cakes, Yule-logs, cookies, mince pies, homemade chocolate bells, snowmen, and Gingerbread houses, perfect for gifts or to enjoy with the family and can be ordered through the hotel and Symphony Gourmet.